I love real estate! This is a business with its ups and downs and sometimes sideways roads to maneuver. Even when you think you might have it all figured out, you usually don't. The next transaction will be the one which proves it to you. There's always change......Rules change, contracts change, disclosures change and yes, the market changes. The one thing which never changes for me is the unbelievable satisfaction I get from helping my clients achieve their dream of owning a home. One of my closings this week was a young couple who are first time home buyers. They wanted to buy a home, rather than throw their money away on rent. Their price point was going to be a bit difficult, even in Indianapolis, where we have the most affordable housing in the nation. I was up for the challenge! I love a challenge! We found the perfect house for them! 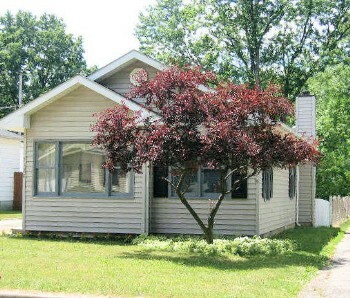 This cute one bedroom bungalow, totally remodeled, original wood floors, large yard, 1.5 car garage and they love it. Not only will they save a couple hundred a month versus renting, the rental history on this home has their payment at about $200. less than rents. They will have a great little investment property once they decide to move up or move on. They signed yesterday, grabbed their keys, walked to their car and everyone in the closing room was excited as we watched them walk across the parking lot. I was on cloud nine the rest of the day! The immense satisfaction makes me want to go out and do it again and again. This is what I do, help make dreams come true! Later in the afternoon, I received a call from my office; I had a package delivered. I picked it up today. Inside was a spa package and a note from my clients.